This doesn’t include maintenance, which involves ongoing costs for staff and materials to combat wear and tear, vandalism, and more. See also: What happens to transportation projects under President Trump? The land border between the United States and Mexico spans nearly 2,000 miles. This is a long stretch of land, especially when you compare it to the 156 miles that make up Mexico’s southern border. It could be argued that it would be quite a bit cheaper to offer to build a wall along Mexico’s southern border. After all, most of the undocumented immigrants coming from Mexico are simply passing through from other nations that sit past Mexico’s southern border. At $25 billion, the estimated cost-per-mile for the border wall sits at $12.8 million. There is an existing fence in place spanning about 670 of the 2,000 miles, but we do not have any definite answer as to whether or not that fencing will remain in place. But, all signs point to a new wall being built along the border. Who will pay for it is yet to be determined. For now, the taxpayers of the United States are footing the bill. He went on to insinuate that the wall would be as much as 90 feet high. The Washington Post analyzed the border wall plan and the continually-evolving estimate of its height. Its breakdown put the wall somewhere around 55 feet high as of February of 2016. This would be in addition to tons of steel reinforcement and other materials. It’s possible, but it won’t be cheap or easy. Another major hurdle the wall project would have to beat is that of the real estate required to carry it out. Land owners along the border will be hesitant to give up their valuable acres of land for the project. That means the government will either have to pay the owners a fair value for the land with the owner’s blessing, or evoke eminent domain and take it by force. Donald Trump has repeatedly stated that he would not shy away from evoking eminent domain to secure the land. This would not be a popular choice as it involves taking land from landowners by force. With the existing border wall, we have already seen economic stress caused when the wall is put through or around private land. A Texas golf course was put out of business when the border wall separated it from the U.S. side of the wall near Brownsville, TX. There’s also the question of the natural landscape. Some of the border exists on steep hills, rivers, and other rough terrain. This makes constructing a wall more difficult. 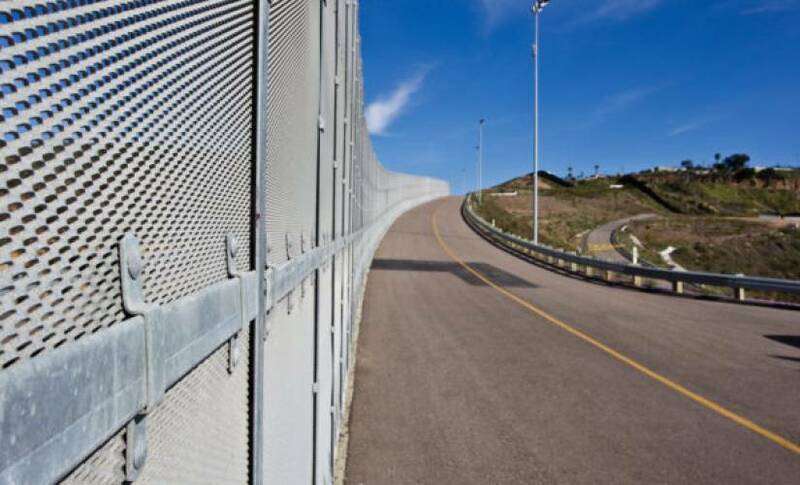 A physical wall that spans between 1,300 and 2,000 miles along the border will be a challenge. So, what would the alternative be? Is there a way to build a wall without taking away private land and ruining the natural landscape? The Internet of Things gives us a whole new toolset to secure a border and better track what comes in and out of the country. Many of these technologies are already being used, but could benefit from expansion. Other countries are already taking advantage of these technologies to keep their borders secure. Israel, after being attacked along its southern border, reached out to a company called Magna BSP which specializes in advanced surveillance systems. With a virtually zero percent chance of false positives, Magna BSP can detect humans walking, crawling, swimming, and driving through border territories. It can then alert border patrol to the exact location and position of a subject. It can also detect carried objects including bags and weapons. When it comes to a physical border such as a wall, inexpensive tech including drones can bypass it. This is where systems like this can come in handy. Magna BSP can detect drones and other unmanned aircraft in the night sky. Another technology already being utilized are sensor towers. These towers are loaded with technology. Radar, infrared cameras, heat, and motion detection give border patrol agents an edge. These towers work together in a network, each within line-of-sight of at least one other. When people cross through their web of detection, the border patrol is alerted and real-time video is available. This solution is not without its challenges. Early rollouts of the technology proved expensive and inaccurate. In 2006, a test of SBInet, the early precursor to today’s technologies, exceeded its budget projections many times over. Since that time, new technologies have emerged that are more rugged, accurate, and long range. A border patrol agent working from an office can detect a human figure over 7 miles away and deploy agents to the location in real-time. A giant concrete wall is expensive and difficult to pull off. Its effectiveness is limited to foot and vehicle border crossings, which make up only a small percentage of the cases of undocumented immigration in the U.S.
U.S. Border Protection officials are already reporting large numbers of crossings taking place by air. Tunnels, which would also bypass a wall, are a common tactic used to bring materials into the U.S. from Mexico. So, if you’re going to spend a lot of money, a wall isn’t your best bet. Instead, better surveillance and quick human response made possible by the Internet of Things appears more reasonable. At the very least, you would get a lot less complaints from the landowners along the border. A tower or some hidden cameras are much easier to work around than a giant, concrete wall.